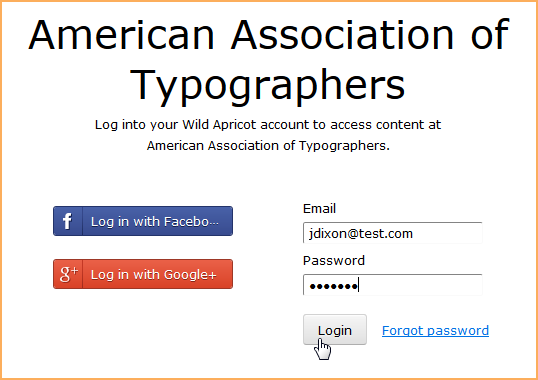 With the Wild Apricot Login plugin, WordPress users can now integrate their Wild Apricot account functionality into a WordPress site. This past month, we conducted a survey to better understand what our customers want and how exactly we can help. Read on for our findings. So, here’s what the Apricots have been up to in June. With the help of a plugin, Wild Apricot and WordPress now speak to each other like never before! The combination of Wild Apricot's all-in-one membership management platform and the WordPress content management system opens up Wild Apricot to a whole new audience. WordPress users no longer need to use multiple plugins with limited capabilities. Instead they can now use the #1 ranked membership management system to help run their organizations. We’ve garnered a lot of great attention from our clients and service partners regarding our WordPress integration, so we thought we’d explain how integrating with WordPress can benefit you! This example shows a single login screen on a WordPress site once the plugin is installed. If you have sensitive information on your WordPress site, you can now set it up so that only your Wild Apricot members will see it. By placing a simple shortcode onto the members-only page, you ensure that only Wild Apricot members who have logged into your site gain access. Admins can now add restricted member-only content from your Wild Apricot system – such as member directories and member-only events – into your WordPress site. With the new plugin, the membership roles that you have set up in Wild Apricot can be used to update your WordPress roles. Once the WordPress roles have been updated, any user who logs in to the WordPress site will have their WordPress contact details automatically updated with what’s listed in the Wild Apricot contact database. For a full list of Version 5.4 features, including a new responsive theme (Homestead), a new line height formatting option, and API changes, see our blog post. Back in April, we expressed our commitment to the success of small membership organizations everywhere, and that just providing software wasn’t enough. These endeavours have been highly successful, and we’ve been hearing some great feedback! Our sincere thanks to the thousands of people who have been part of our webinars, discussion sessions and 1-on-1s. Building out our Community would not be possible without you! We truly want to understand the needs of small organizations. To do so, we had to look at the bigger picture and ask our customers what their needs are. So, we recently conducted a survey of our customers to learn more about the problem areas of running a membership organization. This is what we call our Discovery Phase. We want to discover what the problems are in running a small membership organization – and ultimately, help you solve them. We asked you: If you could wave a magic wand and solve 1 problem in your organization, what would it be? Around 30% of you answered that you’d like to see our software improved. And rest assured, we’re working on it. We’ve been paying attention to your comments and your wishlist posts and we’re happy to announce some big additions coming soon. Follow the status (e.g. under review, developing, released, etc.) of features and get instant notifications when the status changes. And don’t worry, your existing contributions (suggestions, comments, user accounts) will all be migrated to the new platform. Administrators will be able to limit event registrations to one per contact per event. The majority of you, around 70%, are looking to solve problems related to growing membership, increasing event attendance, securing sponsorships and finding reliable volunteers. Look for us to continue our discovery phase over the next couple of months. We want to gather as much as we can in order to shape our content, educational materials and resources to suit your needs. So, if you do get asked for your feedback, please provide it! In the meantime, register now for our upcoming Free Expert Webinar on “Learn How Facebook Can Boost Member Engagement”, presented by author and consultant, John Haydon. John literally wrote the book on Facebook marketing ( Facebook Marketing for Dummies) and is going to reveal his best kept tips and tricks for building a thriving online community. We are on fence about buying WildAppricot for our organization. I was wondering what is the exact date on which the version will be released with support for stripe? Version 5.5 will support Stripe. It's scheduled to be released on July 27th 2015. Fairly new to the Wild Apricot scene. One thing that I notice missing since we non-profits rely so heavily on volunteer support to run events is a sign up sheet system. Yes I could use the events calendar to do this...but I think something like a couple of the internet based software packages (sign up sheets for WP users or Signup Genius) would be a nice feature where guest could sign up for a time slot, on a certain day, at a certain location. Other than that I am sold on the product! Thanks Drew for your feedback!